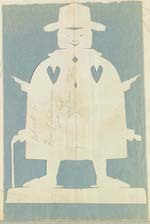 Hans Christian Andersen's Paper Cuts in The Royal Library. Made in Edinburgh August 17 1847 for Miss Ross. Book marker. Paper cuts on silk with witch and owl. Has belonged to Louise Drewsen, born Collin, or her aunt Louise Lind, born Collin. List no. 279, Cat. 474-76. 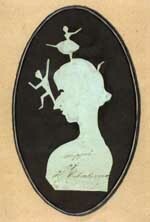 Sigfride Bille has told in a letter of July 9 1950: "This paper cut of Hans Christian Andersen has belonged to countess Raben, born Krogh on Lekkende at Præstø. She has herited it from Miss Charlotte E. Raben, a sister to her husband count Jonas Raben. 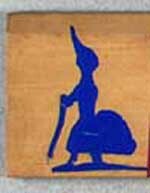 Hans Christian Andersen often visited Nysø and the Stampe family, who were close neighbours to the Raben family on Lekkende. 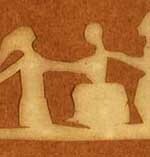 - My grandmother, countess Raben, a long time ago gave me the paper cut." 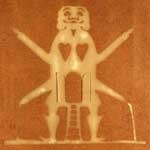 The paper cut was bought in 1962 by Francis Edwards, Ltd. at Sotheby's, and later sold to Rosenkilde and Bagger. List no. 280. Cat. 477. Silhouette with rising figures: a dancer and a harlequin. A figure from the neck has been lost. 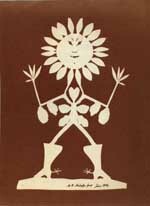 Told by Karen Egede Albrecher: "This silhouette is cut by Hans Christian Andersen and given to my paternal grandmother Misses Sporon, born Bjerregaard, who met Hans Christian Andersen in the home of Governor of the National Bank, Lindemann." Large woman in green with apron. List no. 282. Cat. 479. The Corvette "Galathea" in the harbour of Constantinople. 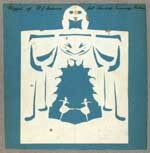 About the paper cut Anders S. A. Bille has told the following, dated August 14, 1922: "Silhouette, cut by professor Hans Christian Andersen and given to his godson Steen Andersen Bille (my father). S. A. Bille gave it June 30, 1884 to his godson Carl Steen Kalani Hedemann. In 1910 C. S. K. Hedeman sent it back to S. A. Bille in order to give it to his sons. By the death of S. A. Bille I became the owner." List no. 283. Cat. 480. Has belonged to Mathilde Ørsted, the daughter of H. C. Ørsted. List no. 284. Cat. 481. 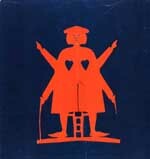 Lay as a book marker in Goethe's "Faust" (1847) with a dedication to Jonas Collin. List no. 285. Cat. 482. List no. 287. Cat. 484. Paper cuts, letter and photo in glass and frame. Cat. 490-493. (See single takings beneath). Medium Ruler with paper cuts (face). 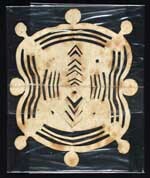 Medium Ruler with pasted flowers (back). With dedication to N. W. Gade, 1872. On each of the 17 fan leaves Hans Christian Andersen has written a stanza, on the last one: "I believe it's most lovely in Denmark."